You take a look at the shiny metallic surface of a sleek sports car and you immediately thought of it as "glossy". You saw another car with a body which reflects none of the ambient lighting, absorbing everything like a black hole, and you think of it as "matte". 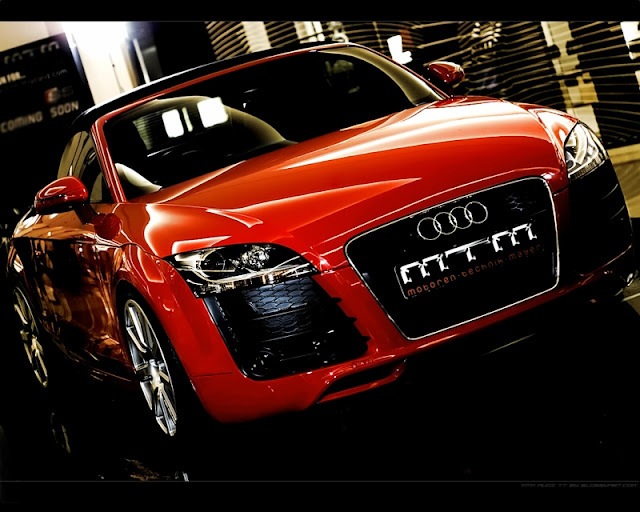 The glossy surface of an Audi TT (image taken from DeviantArt). As easy as the word comes to your mind, how does one define "glossy"? This would be important to an engineer, since there has to be some way to control the quality of a surface, and control will not be possible without measurement, and no measurement without a solid definition. I found that Glossmeters.com gave a decent definition of gloss - it is an attribute of surfaces which causes them to have shiny or lustrous metallic or matte appearance. The more direct light is reflected off a surface, the glossier it is to our perception. In other words, glossiness is a visual perception and gloss effect is the outcome of the interaction of light with the surface in question. In order to view how users usually perceive something as glossy or matte, you could take a car body's surface to illustrate this difference in perception. If the body reflects the details of its environment clearly, it is glossy. In other words, a mirror is a perfect example of gloss finishing. The more the surface is matte, the blurrier the details of reflection, with lines not as clear and contrast not as good. A good visual comparison between matte and glossy surface (image taken from Replacement Laptop Screens). While this serves as a general definition for glossiness, the term itself differs between different industry. A surface considered glossy to a paper manufacturer is still too matte for automotive finishing considerations. Different observant may have different perception on gloss comparison as well - some observant may be more perceptive to differences in gloss than others. Both of these facts - different definition of gloss between industries and different ability in gloss perception differentiation - along with a few others to be shared in future articles, reiterates the importance of a point. In order to control the outcome of the surface finishing to meet the intended cosmetic requirement, there should be a way to measure and quantify glossiness.